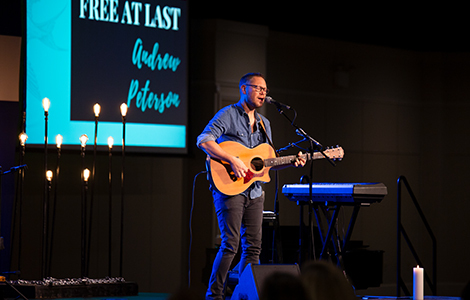 As humans and creatives, we’re all called to bring light into the darkness of the world, and we need a community to help us do that, said Andrew Peterson during his visit to Trevecca’s campus on Tuesday, Nov. 13. Peterson, a Christian artist and author, led chapel and participated in a Music City Colloquy event, where he talked with students about his career and offered advice. During the chapel session, Peterson performed songs such as “After the Last Tear Falls,” “The Sower’s Song” and “Is He Worthy?” Peterson’s latest album, Resurrection Letters: Volume 1 became a Billboard Top 5 Americana/Folk chart hit while being called a “masterpiece” by CCM Magazine. Peterson is also an award-winning author of a young adult Christian fiction series and the creator of “The Behold the Lamb of God” Christmas tour, now in its 19th year. Christian recording artist Chris Tomlin recently recorded “Is He Worthy?” and released his version on his latest album, Holy Roar. During his visit, Peterson took time to encourage students, detailing his unconventional path in the Christian music industry. 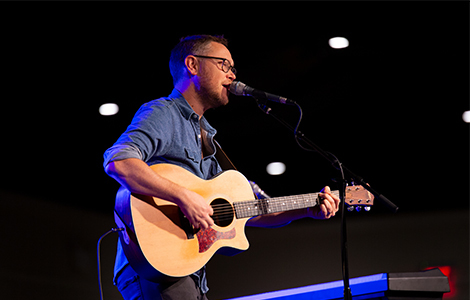 Heavily influenced by the late Rich Mullins, Peterson said he has always tried to create music that he was proud of and was also pleasing to God. Peterson shared with students about his early success in the mainstream Christian music industry as well as disappointments, such as being dropped from his label and choosing to carve out a career path that allowed him to make the kind of music he wanted to make. For Peterson, that meant finding community with other artists who shared a similar vision through groups like the Square Peg Alliance and the Rabbit Room, a blog community created by Peterson and his brother, author A.S. “Pete” Peterson, as a way to foster Christ-centered community and spiritual formation through the arts. “The reason the RR came into existence was my first time in Oxford, as a big [J.R.R.] Tolkien and C.S. Lewis nerd, of course, I had to go to the Eagle and Child, where the Inklings, a fellowship of Oxford professors in their 50s and 60s, mostly Christians who loved stories, had this weekly meeting. The Rabbit Room is now in its tenth year and now includes a publishing house, sponsors The Local Show at Nashville coffeehouse, The Well, and sponsors a yearly conference, Hutchmoot. Peterson closed the colloquy event, a conversation with John J. Thompson, associate dean of Trevecca’s School or Music and Worship Arts, with a piece of encouragement. “If you want to be an artist, if you want to know how to tell stories, I promise, the Bible got there first,” he said. “If you want to be a good songwriter, the Psalms beat you to it. Lean into the [Bible], ask the giver of all good things, the source of all beauty and truth to help you.